Home→Rapidly Rotating Records→Special 2-Hour 18th Anniversary Edition of Rapidly Rotating Records! 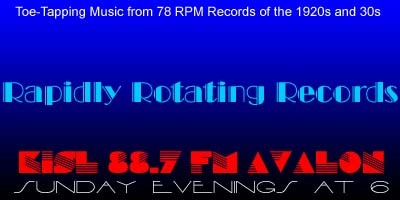 Special 2-Hour 18th Anniversary Edition of Rapidly Rotating Records! For those of you who were unable to tune in over the air or listen streaming online to the recent special 2 hour, live, 18th anniversary show, the plan was to record the show and post it so you could vicariously share in the fun. Unfortunately, due to operator error, no doubt on my part, the show didn’t record. However, all is not lost. I have recreated the anniversary show and it’s now available for streaming online and/or download. Because the show is over two hours in length, I’ve split it into two parts. In the first part of the show I pose a question to the audience and ask you to please let me know your opinion. You can leave a comment here on the website, on the Facebook page, or by sending an email to Glenn@RapidlyRotatingRecords.com. And remember, your requests and topic segments are always welcome. As always, just click on the link below to instantly listen streaming online and/or download the show. Between 18th And 19th On Chestnut Street – Bob Zurke and His Delta River Band / Sterling Bose, v.
When Two Hearts Beat – Helge Lindberg’s Orchestra / Sonia Estelle, v.
You’ve Had Your Way – Hokum Trio / “Banjo Ikey” Robinson, v.
Take Me Away From The River – Fletcher Henderson AHO / Ikey Robinson, v.
My Four Reasons – Banjo Ikey Robinson and His Bull Fiddle Band / Frankie “Half Pint” Jaxon, v.
Pettin’ In The Park – Adrian Schubert’s Orchestra / Kerwin Somerville, v.
Sweet – Henry Lange Orchestra / Kerwin Somerville, v.
The Man That Comes Around – Tommy Tucker Time / Kerwin Somerville, v.
Ten Little Fingers And Ten Little Tows (Down In Tennessee) – Julius Lenzberg’s Riverside Orchestra / Arthur Hall, v.
Money Bus-Ness (Down In Tennessee) – International Novelty Orchestra / Billy Murray, v.
Smiles – Carson Robison and His Deep River Orchestra / Annette Hanshaw, v.
I’m Sorry I Made You Cry – Red Nichols AHO / Tony Sacco, v.